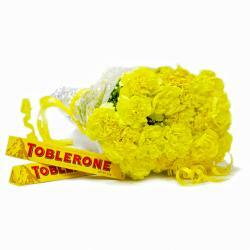 Product Consists: Bouquet of 20 Yellow Carnation along with 16 Pcs Ferrero Rocher Chocolate Box. 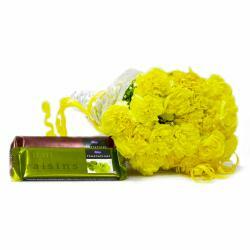 This gift combo contains a super cool Twenty Yellow Carnation in addition to beautiful bouquet which is wrapped in cellophane with a matching ribbon bow on top is 16 Pcs Ferrero Rocher Chocolate Box . This combo will be the perfect bet for surprising your loved ones on almost any occasion including Birthday, Anniversary, Missing You, Ganesh Chaturthi, and Boss Day. This combo adds just the right dose of cuteness to your loved ones life. This gift combo should definitely be on your shopping list ahead of the festive season. Thus, send this alluring Gifts to India through Giftacrossindia and make your recipient feel extra special. 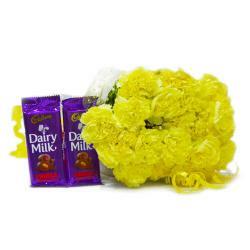 This gift hamper contains : Bunch of 20 Yellow Carnation along with 16 Pcs Ferrero Rocher Chocolate Box.